“Some like it Hot” Chocolate Bar – Alive and Organic inspired by Isadore Duncan, iconoclast, feminist and founder of modern dance. Almond Butter – Alive and Organic 16oz. A $59.36 Value. Yours for $47.49. A discount of 20%. Another really quick and easy throw-it-together meal. 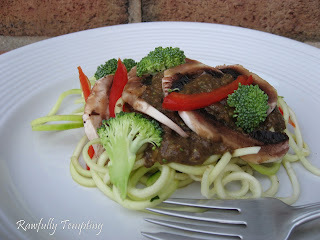 I LOVE zucchini noodles. There are so many creative ways to serve them. I was on my own for the week and didn’t feel like fussing in the kitchen. I literally threw this meal together in a matter of minutes. It’s a keeper! Place in dehydrator at 115 degrees for 30 – 60 minutes if you’d like to warm this. Suggestion: If you have more time, you can marinate some of the garnish toppings in a bit of oil and nama shoyu, and dehydrate at 110 degrees for 1-2 hours. It makes the veggies a little more tender and brings out the bright colors you get when stir frying – without destroying the enzymes! Where are the almonds grown? Is it the verdant and wondrously fertile Central Valley of California or Sicily and Spain? Who grows the almonds? Are they California family farmers who have been on the land for five generations or are they migrant laborers? Are organic standards the same in Sicily or Spain as they are in California? Is the almond butter made over two days or is it just a single pass through the machine? When the almonds are processed, is the almond butter imbued with self-conscious spirit or is it merely a commodity, a lifeless “thing” or object? What about taste? Does the almond butter have depth of the flavor? Does it have character? Can you sense it’s aliveness? (Responsible Technology) The following article by Dr. Ramon Seidler, PhD. is the article on the dangers of Roundup that we should re-post, download, and share with anyone who still supports the use of this dangerous herbicide or the GMO plants that are engineered to be sprayed with it. It also exposes how the US Environmental Protection Agency (EPA) has bent over backwards to ignore proven dangers that are now ravaging the health of our population. The author should know. He is Ramon Seidler, PhD., the former Team Leader of the EPA’s Genetically Engineered Organism biosafety program. He consistently warned the agency about very real risks of GMOs, but was ignored by decision makers. By circulating this article, you will likely inspire someone to stop using Roundup on their lawns. In other words, just by re-posting this full piece, you may prevent someone from getting cancer, liver disease, or possibly numerous other disorders associated with endocrine disrupting chemicals. And hopefully this article will also inspire people to eat more organic food. As the article states, based on urine sampling, Americans probably consume 1000 times the amount of Roundup that causes fatty liver disease in rats. One fourth of all Americans have fatty liver disease. 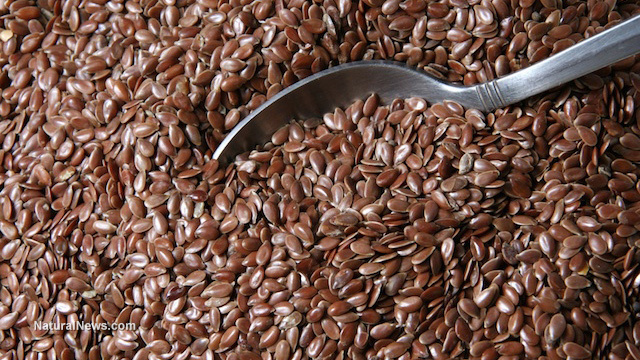 (Natural News) Flaxseed is one of the oldest crops that humans have cultivated. It was initially grown in the U.S. by colonists for use in textile production. Years of research have shown that flaxseed and its byproducts contain high levels of essential vitamins and minerals, making the crop a staple superfood in various diet schemes. An article in AuthorityNutrition.com lists down 10 health benefits of consuming this superfood. 1. High nutrient content – This superfood is touted for having high levels of essential nutrients. According to the article, one tablespoon of ground flaxseeds contain 1,597 mg of omega-3 fatty acids. This serving also contains significant amounts of vitamin B1 and B6, magnesium, phosphorus and calcium as well as folate, iron, and proteins. 2. Rich omega-3 levels – Flaxseeds are known to be packed with alpha-linolenic acid (ALA), a type of omega-3 fatty acid commonly found in plants. Omega-3 is essential for maintaining heart health. A study published in the journal Circulation found that people who had higher ALA levels had a reduced heart attack risk than those with lower levels. Another review showed that higher ALA consumption was tied to a 14 percent reduction in heart disease risk. The findings were published in the American Journal of Clinical Nutrition. 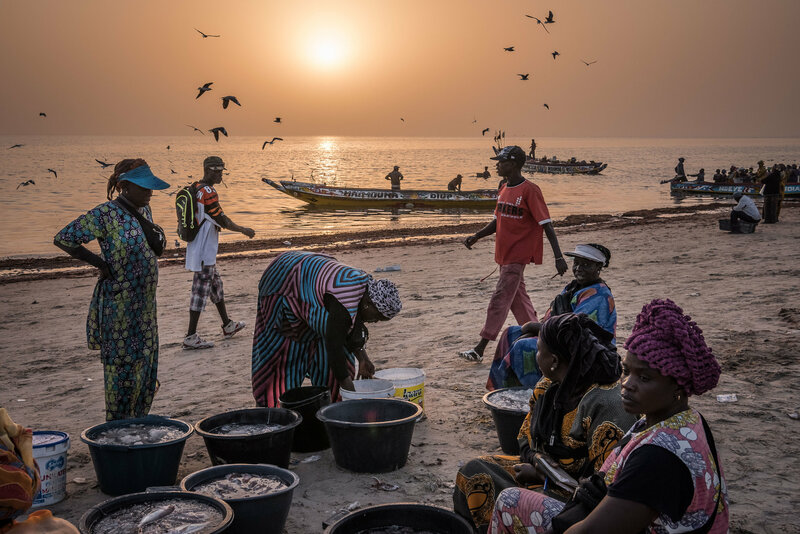 (NY Times) JOAL, Senegal — Once upon a time, the seas teemed with mackerel, squid and sardines, and life was good. But now, on opposite sides of the globe, sun-creased fishermen lament as they reel in their nearly empty nets. Overfishing is depleting oceans across the globe, with 90 percent of the world’s fisheries fully exploited or facing collapse, according to the United Nations Food and Agriculture Organization. From Russian king crab fishermen in the west Bering Sea to Mexican ships that poach red snapper off the coast of Florida, unsustainable fishing practices threaten the well-being of millions of people in the developing world who depend on the sea for income and food, experts say.